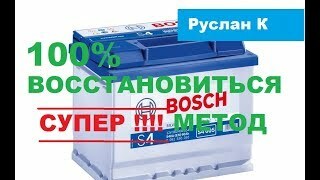 Восстановление старого аккумулятора до 100% полной ёмкости! Лучший метод десульфатации аккумулятора.. Как ремонтировать автомобиль? Все видео пользователя: Руслан К.
Восстановление аккумулятора до полной остаточной ёмкости! Десульфатация аккумулятора с помощью дистилированной воды. Самый гуманный метод для старого аккумулятора. Аккумуляторная батарея заряжается в дистилированной воде пока не будет повышаться ёмкость. This is the second video, how to restore the battery a battery having sulfation. It should be understood that sulphation the process is natural with discharge of the battery. And without problems is eliminated at a charge. the term itself is used. When sulphate is not can be eliminated under normal conditions. Charging mode. Deep sulfation, this when the battery loses almost. All its capacity. Such a sulphation is today to eliminate. There are many methods. Today I will hold desulphation in distilled water water. This is the safest and an effective method.. In the first part, I washed battery from the slurry and eliminated strong self-discharge. Two of these troubles come simultaneously. When sulfation occurs breaking off of active mass. Plates. The active mass sits on the plates, shorts out they and we have a high self-discharge. There is no point in eliminating one problem without the other. If we eliminate only sulfation, then the battery will be fast. Discharge and very quickly again is presulfatized. If we eliminate only self-discharge, the battery will keep. Charge, but will not have capacity. You need to eliminate two Problems.. In the first part I stopped on what filled the distilled. Water. Now put the battery with water on the charge.. The current is 20-30% of the nominal. From 10 hour charger current. I usually give 1 amp. A bit less. And leave to charge. It will be charged for 3-4 days. But at this time the battery do not need to look..
To reheat at this current not work out. and boil. We measure density in jars, it will grow..
Sulfate will dissolve and pass into liquid acid. The process went.. The first time the density will grow rapidly. Will dissolve sulfate on the plates. When it dissolves, the growth in density will slow down..
Water does not have access to pores of plates..
Voltage at the battery terminals it does not matter.. The voltage depends on the density electrolyte.. The next 2-3 days will pass without particularly interesting phenomena..
After 3 days the density will be 1.1 g per cm of cubic..
Sulphate is such a tricky thing, at this density dissolve. Does not want. And at a density of 1.14 this the process stops..
Further density increases will be very, very slow. If this density has become for 4 days..
Then everything goes right. You can charge more day.. Since at a density 1,1 sulfate does not dissolve,. Then you can collect your own charging devices, and. Take them to the garbage. There is a lot of advertising, little use. You can not cheat with chemistry. Good result will not be..
Perhaps, if we put portrait of Mendeleev, then. When such a density is reached you can start watching. On the battery. And when the intensified gas evolution, charge is stopped.. Proceed to the next step. Discharging the battery 1,5-2 hours current of 1-2 amps for 60 ampere. Battery. And again we load..
We measure the density if she grew up, we repeat.. While there is no maximum density..
After this, we have desulphated battery.. The last step is corrected density of electrolyte to the norm. Depending on the climate. I drain the electrolyte and refill. We add acid to the electrolyte, and not vice versa..
Do density A bit more. When pouring into cans it will mix with an electrolyte which there remained the density a little falls. After. All procedures. Close the traffic jams and mine battery..
Will it wipe it dry. and the client is ready.. When recovering the capacity up to 80% of the nominal result. Consider excellent. This gives a good result..